The planned deployment of NATO Patriot missiles along Turkey's border with Syria could lead to a "world war" that would threaten Europe as well, Iran's military chief of staff was quoted as saying on Saturday. 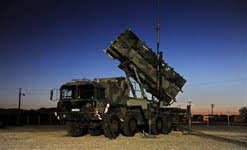 Turkey asked NATO for the Patriot system, designed to intercept aircraft or missiles, in November to help bolster its border security after repeated episodes of gunfire from war-torn Syria spilling into Turkish territory.General Hassan Firouzabadi, the Iranian armed forces chief, said Iranwanted its neighbor Turkey to feel secure but called for NATO not to deploy the Patriots in its easternmost member state, which also borders Iran. "Each one of these Patriots is a black mark on the world map, and is meant to cause a world war," Firouzabadi said, according to the Iranian Students' News Agency. "They are making plans for a world war, and this is very dangerous for the future of humanity and for the future of Europe itself." Iran has been a staunch ally of Syrian President Bashar al-Assad throughout the 21-month uprising against his rule and long a strategic adversary of Western powers who have given formal recognition to Syria's opposition coalition.U.S. Defense Secretary Leon Panetta signed an order on Friday to send two Patriot missile batteries to Turkey along with American personnel to operate them, following similar steps by Germany and the Netherlands.Iranian officials including parliament speaker Ali Larijani have previously said that installing the Patriot missiles would deepen instability in the Middle East, and the foreign ministry spokesman said they would only worsen the conflict in Syria.